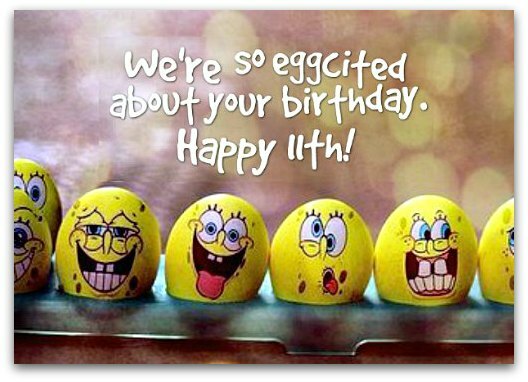 Great 11th birthday wishes, like the 11th birthday messages on this page, have a unique ingredient that can make 11-year-old birthday girls and boys feel as special as they truly are. What's that unique birthday wish ingredient? Basically, it's the ability to convey complicated, yet important sentiments in the language tweeners (kids aged 10 -12) speak every day — without speaking down to them. You'll find that special ingredient in all the birthday wishes for 11 year olds right here. If you need some helpful hints on how to choose birthday messages for 11 year olds, check out Message Guy Tip #92 right now (the tips are for picking 10th birthday greetings but apply 100% to messages for 11 year olds too). Happy 11th birthday! If anybody thinks you're still a little kid, just tell them you're now 4,015 days old (that'll show those old farts). Today, you're ELEVEN! That makes you Extraordinary, Loving, Excellent, Victorious, Exceptional and Nice. Happy 11th birthday! Happy 11th birthday. There are 11 great things about being 11. At this age, you're loved, happy, healthy, cool, smart, funny, cute, unique, exciting, imaginative, and, most importantly, caring. ...milestone all the same. Telling 11-year-old kids to enjoy the age of 11, simply because they're going to be 11 only once in their lifetime, is the same as saying that being 11 is super special. That's what I love about the 11th birthday wish right below. Happy 11th birthday. Being 11 is amazing. Don't rush to be a teenager just yet. You'll have seven years to be a teen and only one to be 11. On your 11th birthday, your wishes come true even sooner when you make them at the luckiest wish-making time of the day: 11:11! Happy birthday. At 11, something cool and really interesting happens: you get to start reading all the cool, really interesting books in the Young Adult section. Happy birthday. Now that you're 11, you're going to start growing up even faster than ever, so just have fun and enjoy every moment along the way. Keep searching for the perfect message! Happy 11th birthday. At your age, time starts to fly. Remember to enjoy yourself — try new things, be courageous, make new friends and do not worry! On your 11th birthday and every day of the next 12 months, we wish you all the best life has to offer. Happy birthday! Hope your 11th birthday is as awesome as you are. May all your 11th birthday wishes come true. Happy 11th birthday! 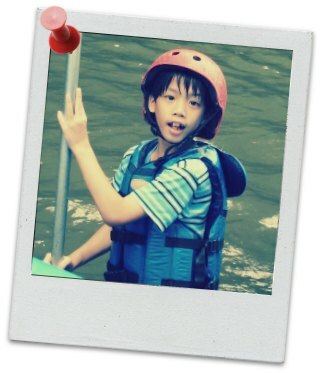 May your 11th birthday and the next year of your life be full of only fun times and happy memories! Happy 11th birthday! 11 years ago today, we were given a precious gift of love that just keeps getting more lovable and loving every day. That gift is you. Happy 11th birthday! Happy 11th birthday. You only get to be 11 for one year, so enjoy every second of it, doing all the wonderful things 11 year olds can still get away with (like never picking up after yourself). Happy birthday! You're growing up so fast. Today, you're 11 . In only two years, you'll be a teenager. Maybe it's time to start stocking up on deodorant and breath strips! Happy 11th birthday. Today, you're around 4,015 days old, so everyone should really take you seriously. Power to the 11 year olds. 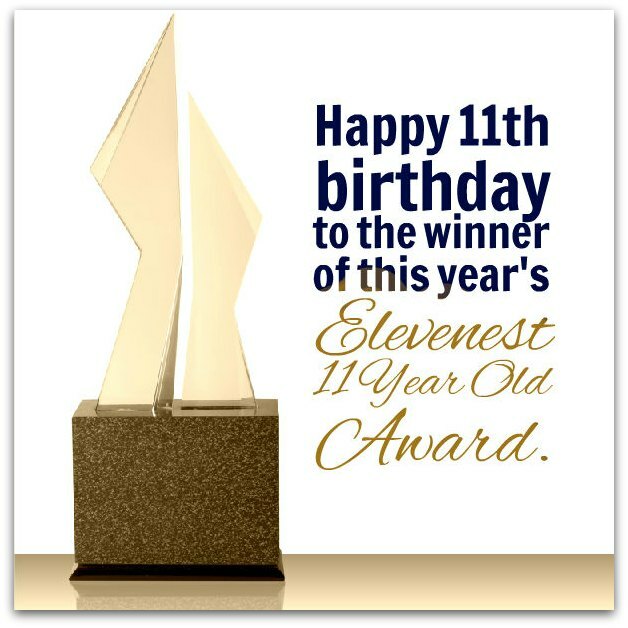 And the winner of this year's Elevenest 11 Year Old Award goes to...you, of course. Nobody's going to be better than you at being 11. Happy 11th birthday! Want to add inspiring tips to your message? If you want to add some helpful thoughts to any of the 11th birthday wishes on this page, click here to check out a scholastic.com post on the 11 year old mind. Knowing how a boy or girl at age 11 thinks will show you exactly what you need to add to my birthday wishes above.